Back in 2011 Richard had a really good idea!! "We have all these fantastically friendly animals that you (Liz) keep collecting, why don't we let everyone meet them? 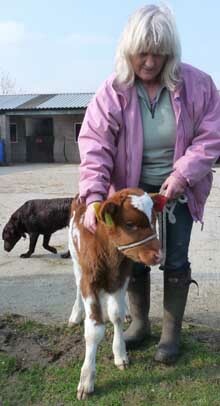 Instead of schools taking their pupils to the farm, the farm could go to them & the animals can help earn their keep." In the early days Richard & Liz were helped enormously by their friend Ben Heaps, a farmer friend who gave them some great ideas & lent them some of the animals they took to schools. One initial problem was they didn't have any photos - they had the animals, but hadn't been to any events. Problem solved - they had a Mobile Farm open day on Fishers Farm stable yard & invited friends & family. They took lots of photos & the website went live. They then searched through the internet & made a list of school email addresses & sent out mail shots & gradually the bookings started to trickle in. The very first Fishers Mobile Farm event was a private party in November 2011 which Liz & Rachael (who kept her horse on Liz & Richard's livery yard) went along to with Jam the pony, 2 pygmy goats, chickens, rabbits & ducks. The first school to book the Mobile Farm was Atherton St Georges Primary School. So in April 2012 Liz & Ben took 2 trailers loaded with animals along to the Atherton School - Richard came along too on his way to his regular job in Salford to help set up. 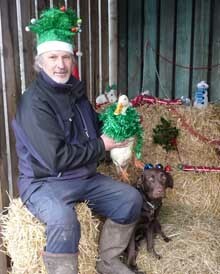 The day was a great success; all the animals behaved perfectly & the children & staff loved it. Liz was then able to start adding photos & lots of fantastically complimentary testimonials to the website. 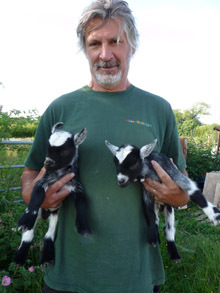 By 2013 the farm was doing enough business for Richard to give up his project management work & to concentrate on helping the Mobile Farm succeed. In that year they were short listed for the Farm & Countryside Education ‘Farm to the Classroom’ award & in they also obtained the Learning Outside the Classroom Quality Award. Over the next 3 years Liz & Richard's Mobile Farm business went from strength to strength & by 2016 the Mobile Farm had visited 100's of schools in the North West & over 30,000 children had met the friendly farm animals. 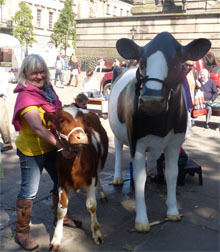 The Mobile Farm also attended many public events, booked by local authorities for town centres & country fairs. Places the farm had set up ranged from scout camps through pubs, garden centres, wild life parks, flower shows, country fayres, museums, public parks to mosques & cathedral grounds - & has even shared an hangar with Concorde at Manchester Airport. Celebrities the animals have met include TV Chefs, Soap Opera Stars & England Footballers & Rugby Players. The animals have appeared on various local radio stations with BBC Lancashire doing a live broadcast from one of our school events & the animals have featured on the front page of the Manchester Evening News many local papers & even in Hello! Magazine. In 2016 it was Richard's 60th birthday, so Liz & Richard took the decision to retire. They sold the business to Ben Heaps who had helped them from the beginning. Liz still helps Ben with keeping the website updated & creating the artwork for the staff t-shirts. 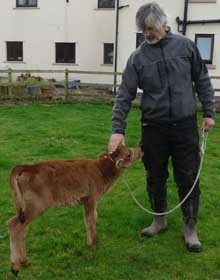 Richard & Liz also decided to make another big change in their lives - they have moved to Morfa Nefyn in Wales.....along with their dogs, pet sheep, goats, chickens, geese, horse & donkeys. The internet makes it easy to keep in touch with Ben, Liz & Richard keep track of the farm visits by following the Mobile Farm Facebook page. The Mobile Farm is looking forward to many more busy years under Ben’s guidance & leadership.
" With over 6 years of experience at running Mobile Farm events, customers can be sure that we have learned to do it right – we know what works well & what doesn’t."